I need to start by saying that this is our first dive into keeping fish. We’ve gotten a lot of great advice along the way so far from both local friends and the Reef Central forums. We also realize we still have a long road of learning ahead of us. We’d definitely appreciate any words of wisdom from the reefers out there. Feeling up to the challenge, we dove straight into a fish only saltwater tank with plans to convert to a reef tank once we built some confidence down the road… which ended up happening pretty quick. So far our dive into the reef keeping world has been a blast. Would love some feedback on our progress so far. You guys did a fantastic job! Congratulations ! Welcome!! The tank looks good. Just had to get a sunken submarine didn't you? Welcome aboard! tank looks good for your first go around! Way to be patient and it payed off! Great start! The only real concern is the Mandarin if he is not eating prepared food. 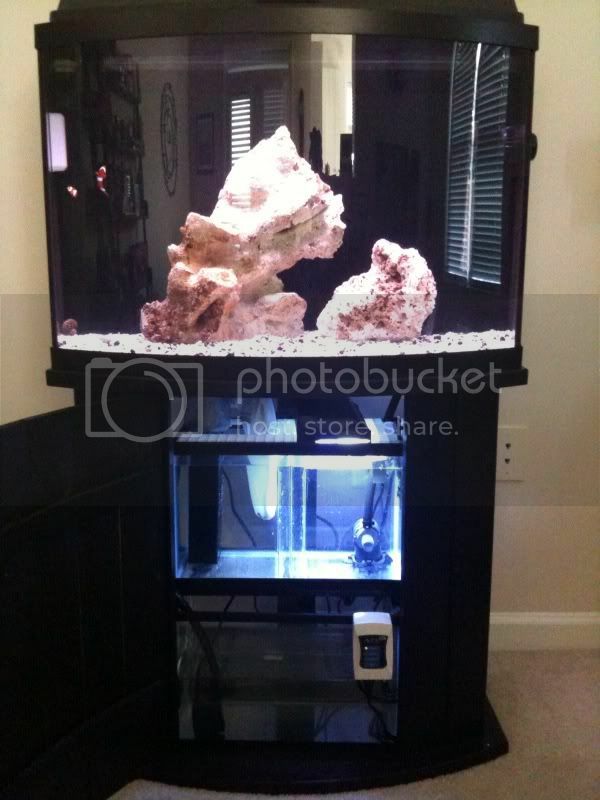 You don't have large enough tank to keep it fed with just the live rock. Excellent start to a beautiful tank! Welcome to RC! and I agree with ^ about the Mandarin. Do a google search about "Mandarin Diner" and you'll be led to a website with a video and explaination of one method to perhaps feed the mandarin enough. It may be it's only hope of survival. 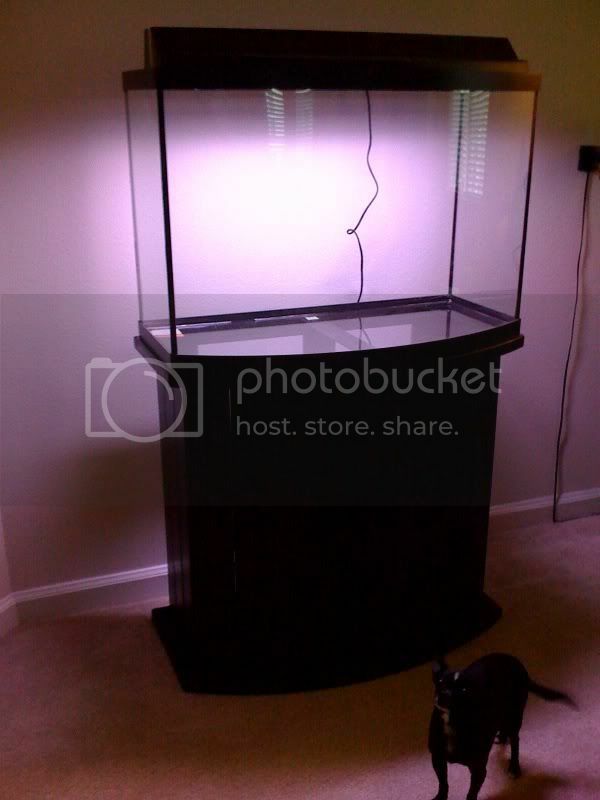 If you get it to work, you'll be able to keep that lovely fish in that size tank no problem. "If there's nothing wrong with me... then there must be something wrong with the universe!" Of course. I'm a prior submariner. Gotta represent. Thanks for the concern on the mandarin. Mandarins have quickly become a favorite and I definitely hope to keep this one healthy. I got the Mandarin as a part of pair back in August. I lost one while in QT (believe due to not eating enough and me not reacting fast enough). The remaining one has done great so far. She readily ate shrimp ova and arcti pods in QT, thanks goes to ORA for raising them on frozen food. She has subsequently grazed for pods, etc all day after moving to the display tank. No way to tell if she's only eating pods or also frozen food leftovers in the display. Still have pods visible on the glass of the display tank after several months and the mandarin is pretty fat so I think we're ok so far. I'll give her up to a better home if things ever start turning south. Congrats on a great start. 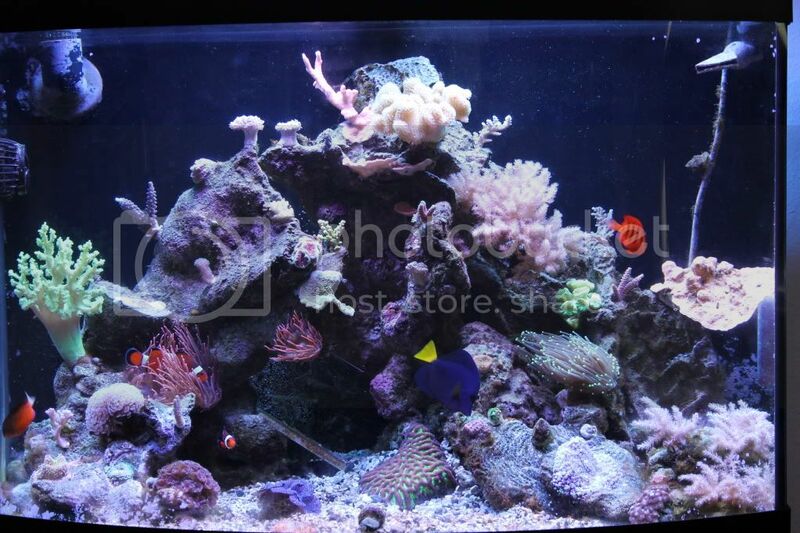 150 gallon reef system with 75 gallon stony coral dominated display and 75 gallon macro display. It has been a while (8 months) since we updated this threadand we thought it was a good time to share our current tank status with you guys. We've made a lot of changes sinceour last post. 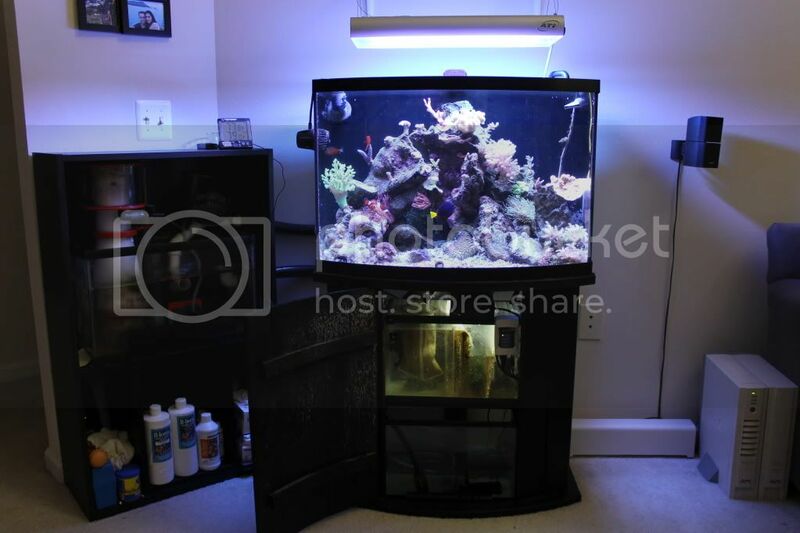 Realized that the Tunze Nano Skimmer wasn't going to cut it for where we wanted to take this tank. 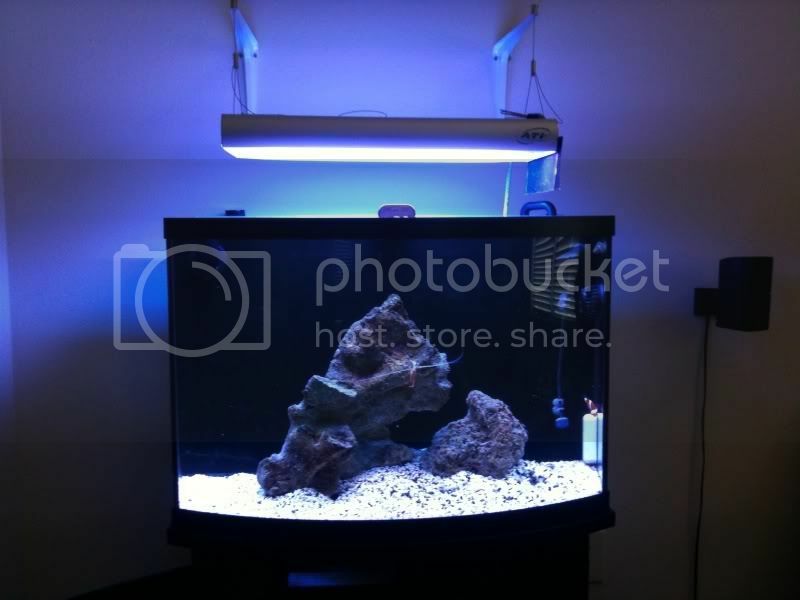 Moved the Tunze to skim a 10gal QT Tank. Got a used ATB 840 with a Sicce 1000 pump for the DT. 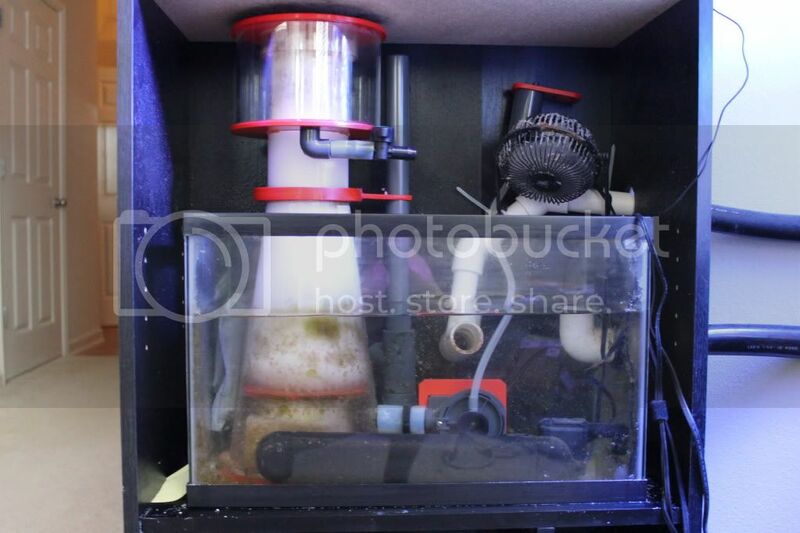 Note to anyone thinking about a 36gal bowfront: It is rediculously difficult to get a sump tank large enough to hold a decent skimmer inside an AGA 36 bow stand. 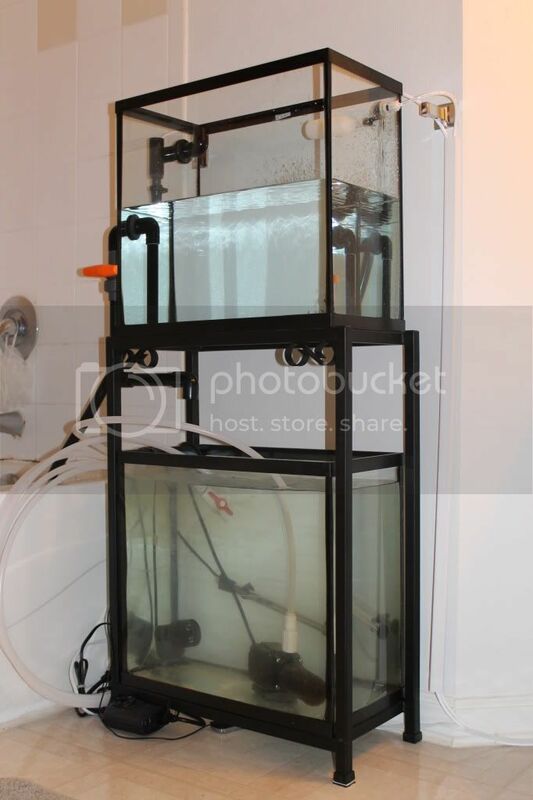 After some serious trial and error we gave up and decided to plumb an extended 10 gal tank into the sump system. Coral Additions: We started to dive farther into SPS this year. Special thanks to copps and gws3 for some gorgeous speciments. Had some close calls with extended power losses last winter and made some investments in power continuity to ensure the tank stays up at all times. 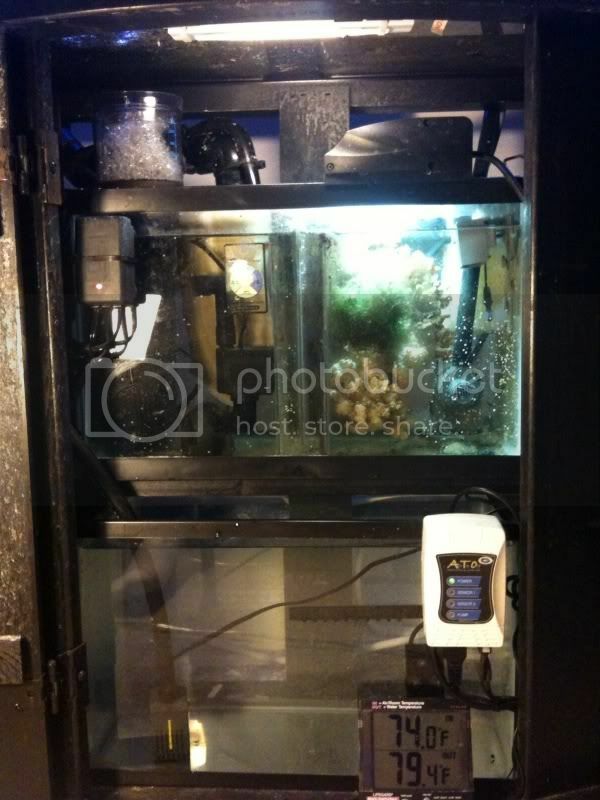 Aded an RS1500 APC UPS with extended battery pack and hooked it up to the VorTech in the display tank. Definitely had a few ups and downs over the last 8 months but we are learning from our mistakes. We are about 1.5 years in on the tank and overall it seems to be veryhealthy. As always comments are welcome. Would love some feedback on the tank. Tank looks great!!!.... 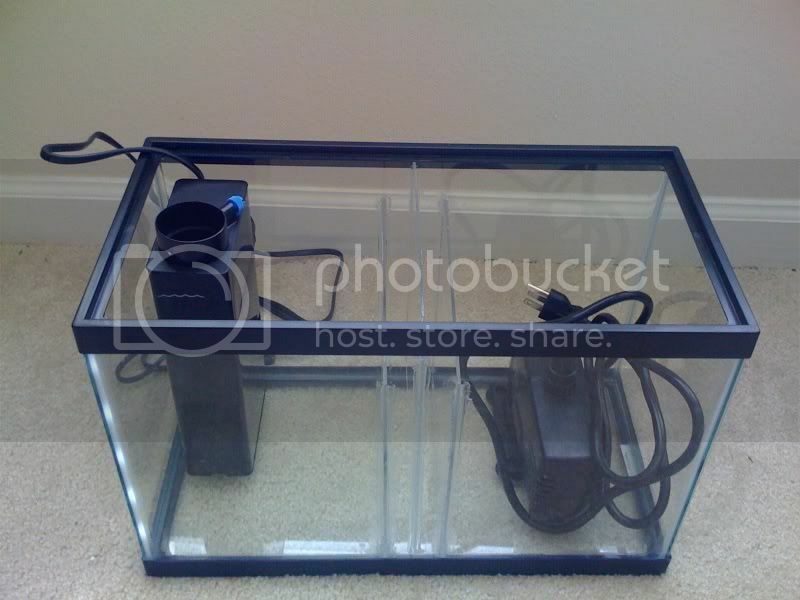 but you might wanna get prepared for comments about the purple tang in such a small tank. 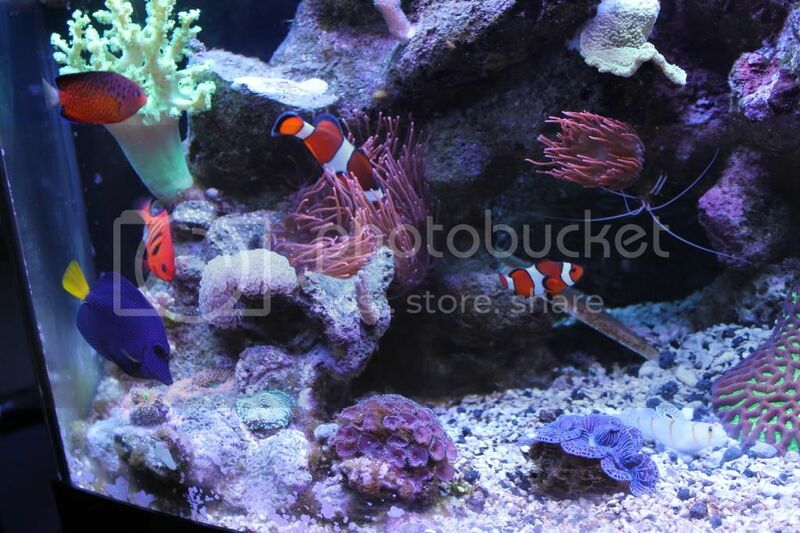 And the 2 angel fish in the same tank. I started off with a 36 bow... I loved it but I did everything wrong. I drilled 4 holes on such a small tank... The glass cracked 3 times! 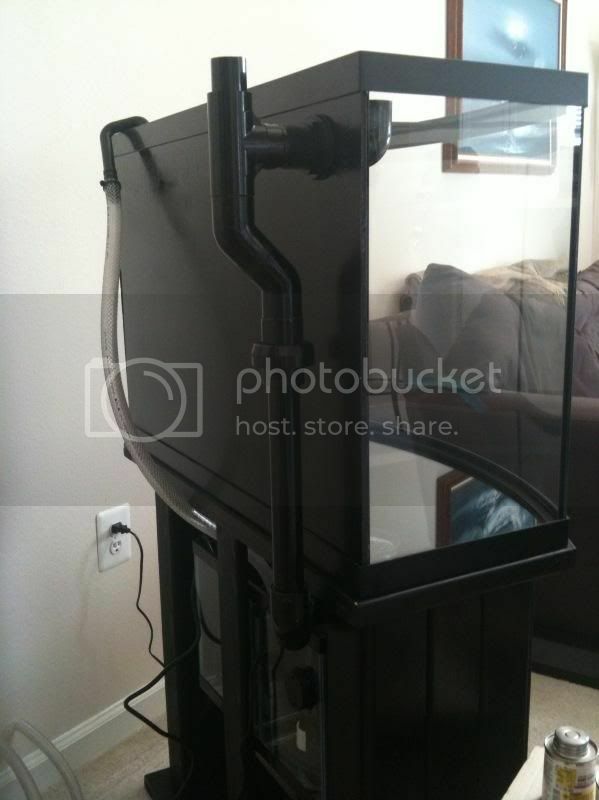 (yep, I went through 3 of the same tanks and didn't learn) I now have a reef savvy 75 gallon which I love. After seeing your build, I kind of miss my 36.. I like the look of the bow front. Great live stock! Last edited by JCeballos27; 10/24/2011 at 03:32 PM. Last edited by JCeballos27; 10/24/2011 at 03:38 PM. Long term, I think you're overstocked in the fish department. Might work for a while. You've done a beautiful job on the hardware. And your stocking was fantastic until I saw the tang and anthias post. Er, those fish and very not recommended for 36 gallons of salt water. If you haven't added the anthias, I would return them to the LFS. 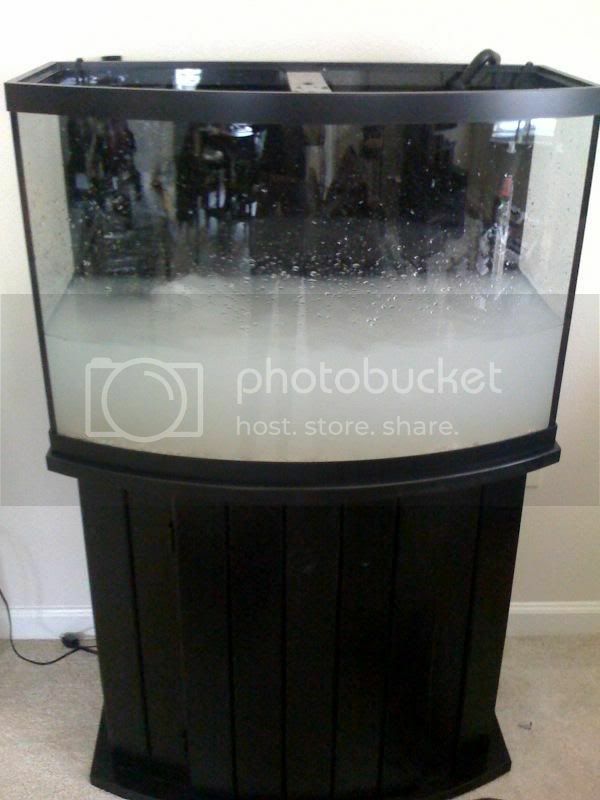 Your stock list now is more for a 125 gallon tank. I guess you'll have to get a bigger car. 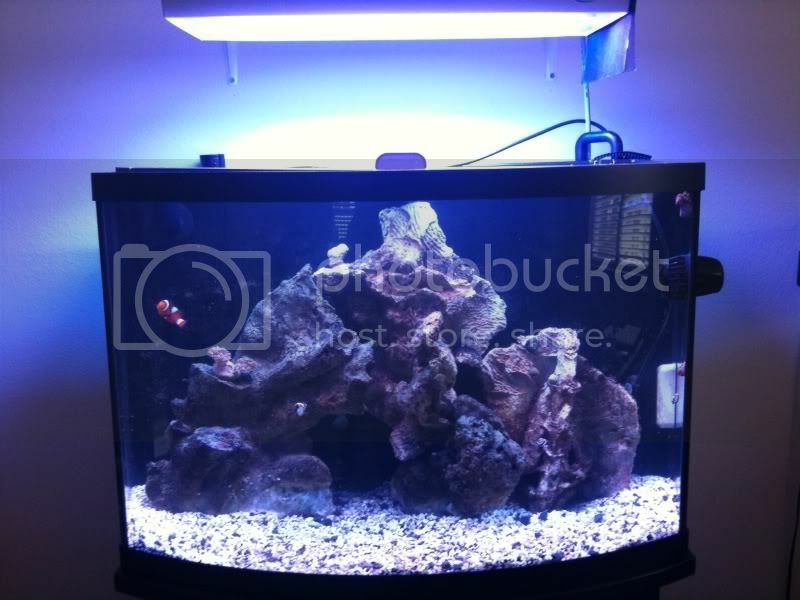 Current Tank Info: 75 mixed reef. 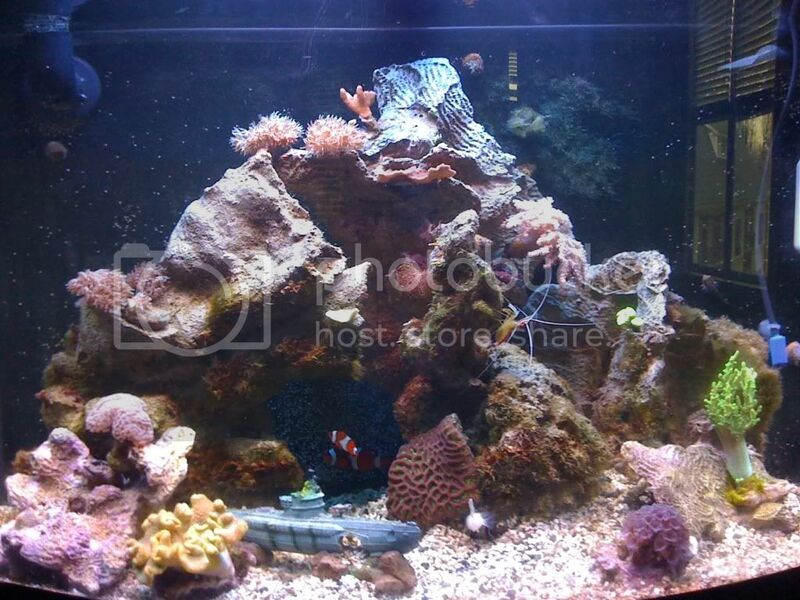 F OSFF, Clingfish, M/F Leopards, M Mandy, Darwin Clown, Bullet Goby, Green Clown Goby, M/F Matted Files, Bluestripe Pipe, Tailspot Blenny, Canary Wrasse, Royal Gramma, Papua Toby Puffer, Snooty Maori Wrasse. Did the Resplendent Anthia ever go into this tank? Was thinking about whether a trio of those in a 46 bow with ~55g total volume would be a bad idea or if others had accomplished something similar.